What is Sulfur (Hydrogen Sulfide) in Well Water? Sulfur Water or Hydrogen Sulfide (H2S) is a colorless dissolved gas present in some well water supplies. Sulfur when released by opening a faucet has a disagreeable "rotten egg” smell and is quite noticeable even at low concentrations of down to 0.25 ppm/mg/L. Sulphur can be poisonous to humans at high atmospheric concentrations, can also be flammable, and is corrosive to most metals (can tarnish silverware). Sulfur water is created by sulfur-reducing bacteria present in ground water supplies that uses the element for energy and produces the foul smelling gas as a byproduct. Sulfur water issues tend to be a local or regional nuisance. The bad smell of sulfur bearing water can come and go for no particular reason; it can be worse in the summer because of higher ground water temperatures and changing water levels in a well. What is Iron in Well Water? Iron in well water can be very troublesome by staining kitchen and bathroom fixtures, laundry, dishwashers, and other water using appliances. It will make hot water smell terrible by reacting with the anode rod in an electric water heater, giving the water a smell similar to sulfur, and iron can also eventually clog piping. The water will have a distinct irony taste even if used in coffee or tea. Clear Water Iron (ferrous) is totally clear when drawn from a faucet but soon turns brown as it reacts with the oxygen in the atmosphere. Red Water Iron (ferric) as the name implies, is red and or brown when drawn from a plumbing fixture. Bacterial Iron or Organic Iron develop over time in a well system and can create an infestation deep down and between the rock fissures causing serious clogging of pipes in the well and in the home, an oily sheen and foul taste, and sometimes a smell similar to diesel fuel. Colloidal Iron can be seen in a water sample, as can Red Water and to some degree Organic Iron, but it has a pink color and specks of iron can be seen floating, seemingly never settling out, because it has a specific gravity nearly that of water. Water from a well can contain one or more forms of iron, this of course complicates the process of finding the correct solution, but a permanent fix for this perplexing problem can be found. Get the Great Water you and your family deserve! 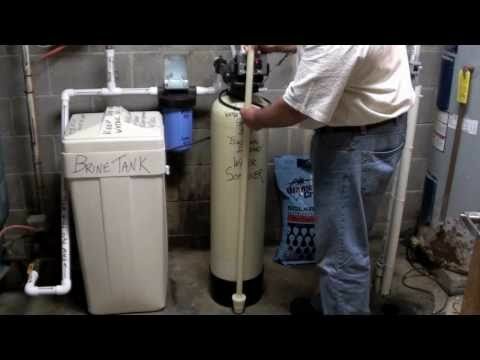 Our Patented EcoSoft Water Treatment Systems Electronic Demand Water Softener w/ EcoVent Sulfur Removal Technology is a new type of Water Softening System that combines closed pressure aeration (with air injector or air pump) and ion exchange Water Softening in one simple system. Water Softening, Iron and Hydrogen Sulfide (rotten egg smell) removal – all with no more maintenance than a standard Water Softener! No other system made today has this new technology. Available in Standard 32,000 grain and Super Heavy Duty 64,000 grain capacity versions with single or dual micronizers (air injectors) or single air pump for extreme water conditions. Call us today for more information about this new breakthrough in Water Softening Equipment for your home or business.